This Valentine’s Day, I’m more than a little confused. I can’t tell if something important in my life has ended or has just begun. I was going to make oeufs en meurette for someone, but we’re planning to not see each other for awhile, even though everything between us feels so wonderful and right. Some days, the newfound freedom feels exciting and full of potential. Other days, I feel like the 4-year-old version of myself who lost her precious teddy bear named Charlie and wailed at the top of her lungs until my mom had to take me back to the store to figure out where it had gone. This morning, I did the only thing that felt right. I woke up early, cleaned the kitchen, and made madeleines. I’d been collecting madeleine pans each time I saw them at the thrift store, and I delighted in it, as though I was rescuing lost puppies from the pound. I have five of these beauties now, both small and large, all of them weathered and old. 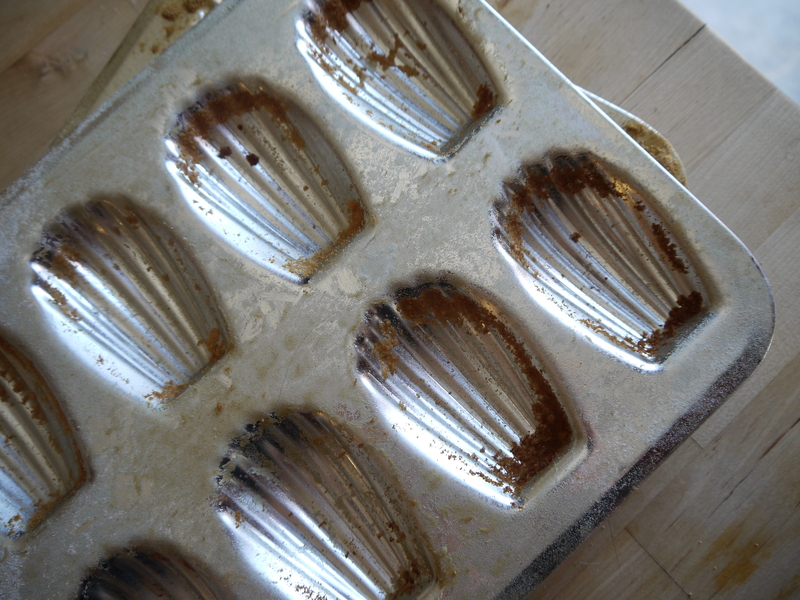 I’m not sure what I like more about madeleines, their literary history as a vessel for Proust’s childhood memories, or that I find the scallop-shell shape so pleasantly reassuring. Venus was born in a scallop shell, a full-grown, sensuous woman perfectly beautiful from the moment she took her first breath. Madeleines are like that, and I’ve always thought about Venus to remind myself that I am too, no matter what life might take away from me. 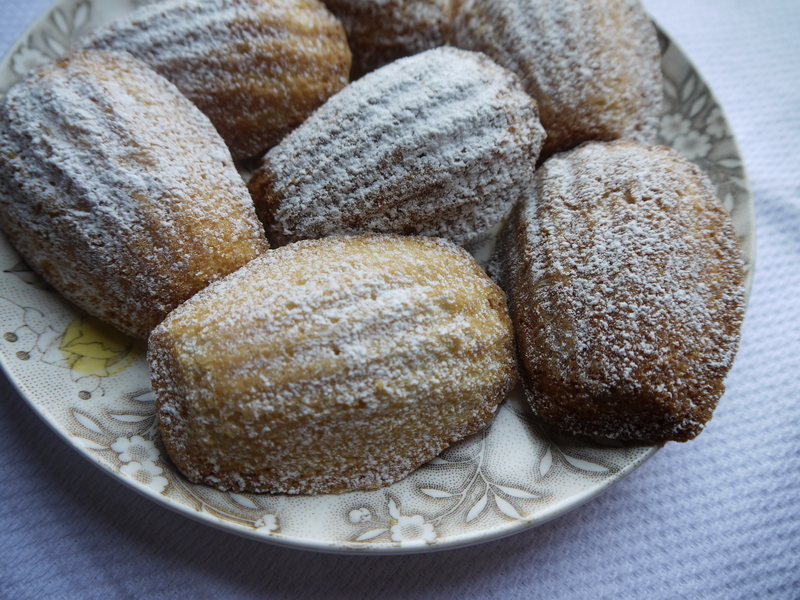 I love madeleines because they are so plainly beautiful, so simply and exactly what they are. Maybe I was drawn to them as a reminder. Don’t lose yourself, don’t change for the sake of someone else, and certainly don’t worry about what’s to come. 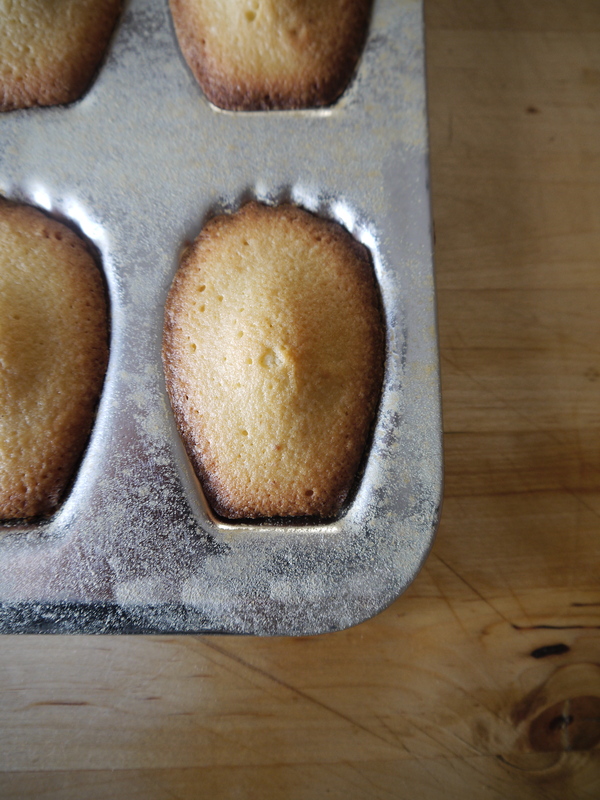 One day years from now, I’ll make madeleines again one morning. I have no idea what kitchen I’ll be in, or who I’ll be with, if anyone. I have no idea what I will think about how I feel now. But I’m confident the madeleines will bring in a flood of wonderful memories, as I’m a person who will always be happy with whatever shape my life has taken on. This entry was posted in Tete a tete (That's French for "dating"), Things I Make and tagged Dating, Food on February 13, 2011 by Carrie. Ingredients: 1 man. 1 woman. Many good intentions and a healthy dash of ego. Directions: Mix everything together and hope for the best. Ten minutes ahead of schedule, DW called and said “I’m standing outside by a beautiful cathedral.” That meant he had arrived, so I went downstairs to let him in. We hadn’t seen each other in awhile, and with the prospect of this dinner date, there was a good spark in the air that continued throughout the evening . . . or at least most of it. Given that our connection was new and we weren’t eager to define anything, we never put any terms to our relationship. I knew he had a date earlier in the week, so I was planning my playful inquisition to get some of the details. I would wait until the end of the meal. 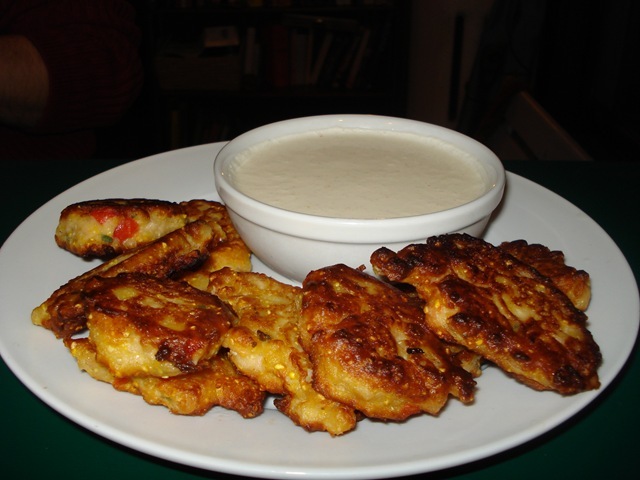 One of my favorite food combinations is white beans and sage, so to start, I made pan-fried white bean fritters. I mixed a batter of flour and cornmeal with cannellini beans, peppadew peppers (I love those things), and sage. I pan-fried it by the tablespoon on high heat. With a dusting of salt, I had a flirty fall appetizer. Share, dip, repeat. To dress up the sacred fruit, I made fig and fennel pizza starting with a creme fraiche base that included lemon zest, cinnamon, cayenne, and a little sugar. On top of this base, I added fennel (sliced thinly and caramelized in balsamic), steamed spinach, figs, garlic, and rosemary. This combination proves strange enough to get anyone’s attention but satisfying enough to be eaten indiscriminately. He paused. “Do we have to talk about that now? I think we should just enjoy the moment,” he said, diving back into his meal. 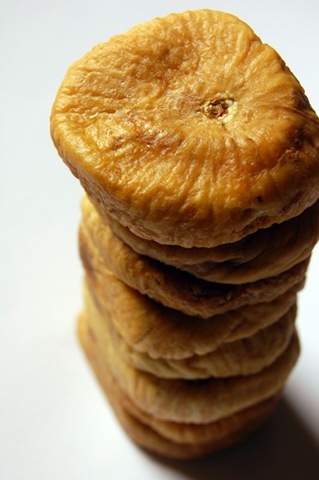 Nutritional information: On a short-term basis, the undefined Almost-Vegan Date is very good for you. Long-term potential should be defined in traditional terms for maximum health benefits. 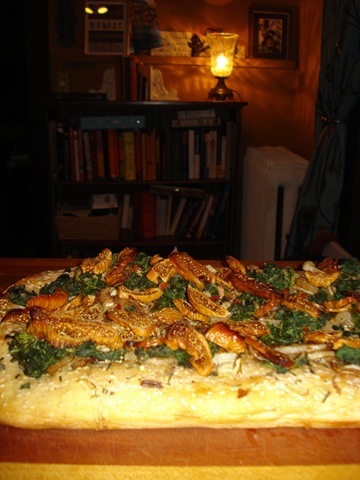 This entry was posted in Tete a tete (That's French for "dating"), Things I Make and tagged Dating, Food on October 28, 2008 by Carrie. I had a long and productive late-night conversation with DW last night, and at the end of things, we decided we’re happy to continue seeing each other. “You know what this means,” I said. “I’ll have to make dinner for you.” The connection between us has been fun and carefree. We’ve gone for walks and attended book events, but not once have we been to a restaurant or shared a one-on-one meal. If he could, he might live on literature alone, with a big side of guitar. One night at his place, he decided that he wanted to fix us a snack. In a few minutes, he showed up in the living room of his apartment with hummus (“Egyptian homos,” he said like an American, pointing to the package and laughing, imagining a group of gay men from Egypt), pita, and a few stalks of raw asparagus poking out of each of his clenched fists. This was an endearing moment, standing next to his canon of serious books like a happy kid with something to share. He gave us three stalks each. “I’ve never really ate raw asparagus,” I said, more surprised than anything. He enthused about its virtues, telling me to chew it for a long time for better enzyme action, and apologizing that he accidentally bought white pita. What a curious guy, I thought. He’s not all that interested in food (and doesn’t eat cheese or much meat), but he is concerned about whole grains and discussing the finer points of digestion. So back to last night, as I tried to fall asleep, mostly wide awake and disoriented from the late call, I put aside the bigger questions of the evening and wondered what this guy might want for dinner. This entry was posted in Tete a tete (That's French for "dating"), Things I Make and tagged Dating on October 20, 2008 by Carrie. How long do you think it takes for a city to get you with its charms? When I lived in Manhattan, it happened the moment I walked out of my apartment and realized that Bleecker Street, Washington Square, and two-dollar falafel sandwiches were just around the corner. I was so excited. It was so easy to live at large. When I lived in Chicago, it took longer to feel that connection. My job was located in the deep burbs (equally as inhospitable as the “deep south”) and I spent way too much time in my car. It wasn’t until I got to know a particular urbanist, Joseph DuciBella, that I was let in on the secrets of the city and started to feel truly at home. If we created a simple list of charms, the Twin Cities wouldn’t easily stack up to the rest of my geographical resume. But still. After three years of living in St. Paul, I feel an almost surreal sense of having been here a long time. When I went to Manhattan, it was about a degree. When I went to Chicago, it was about a relationship. This town has been all about me. And that, of course, is an education unto itself. I feel like cultivator, layering people, stories, and experiences together in a way that makes sense to me. It helps that I have a cool job and great friends, and also that I am single. A few bars, neighborhoods, and restaurants have quickly become classic, and both cities feel like a foundation on which we all can do most anything we please. I often see people I know, and the baristas serve me without asking what I’d like. In MSP, everything always overlaps. I feel like I’m starting to live at large again, but this time in a totally personalized sort of way. To make a city love you, you must first fall in love with something it offers. I started with those things that seemed special about MSP: coffee shops, co-ops, and Magers & Quinn. I’ve discovered some of my favorite books at Magers & Quinn as though they were shelved there specifically for me, and as an editor, I’ve attended a number of my author’s readings. Last week, I went to Magers & Quinn to see Steve Lerach read from his new book Fried: Surviving Two Centuries in Restaurants. I also brought a date, which is another way to make a city love you. See a lot of people. My date asked the best questions during the Q&A, and after the reading, he introduced me to three or four of his friends who happened to be in the crowd. There was the quirky academic he used to work with at the Black Forest Inn, and they told some hilarious server stories. There was also the cool duo who co-host the Wednesday Spoken Word show at KFAI (where my date is a DJ). The whole night became a reflection of the book we went to hear about. Part of why Steve Lerach is credentialed to write Fried is that he has lived and cooked in Minneapolis for thirty years. Thirty years! He told us how his book started out as a master’s thesis on the history of restaurants as far back as the French revolution. But the more he dug into the past, the more he saw parallels to the people he has worked with throughout his career, and this cast of cooks and sous chefs took over the focus of his writing. Eventually, his story became their story instead. Their story demanded to be told. And that’s another way to make a city love you. Let the story of its people become your story, too, whether you have lived there for three or for thirty years. This entry was posted in Around Town, Tete a tete (That's French for "dating") and tagged Dating on October 14, 2008 by Carrie. “Can I begin my analysis now?” I asked my restaurant-loving date, T, as we settled into our seats at the three-week old Pop!! in downtown St. Paul. The location in Northeast has had some success and we were eager to see how it came together in the fairer of the two cities. My honest answer one appetizer, two entrees, two cocktails, and a bottle of Malbec later is this: Eh. I’m not sure yet. Pop!! is well-intentioned, but we felt that none of the elements came together in a truly memorable way. We ordered Picadillo Empanada appetizers stuffed with seasoned ground beef and served with olive relish and chimichurri sauce. We agreed that the empanada dough tasted flat, as thought it had sat for awhile, and would have loved more of the chimi sauce. T and I walked off into quiet St. Paul and the first cool night of the year. “I still want to go to a ‘real’ restaurant with you,” I said, given how much we enjoy food, restaurants, and all of the opinions formed therein. 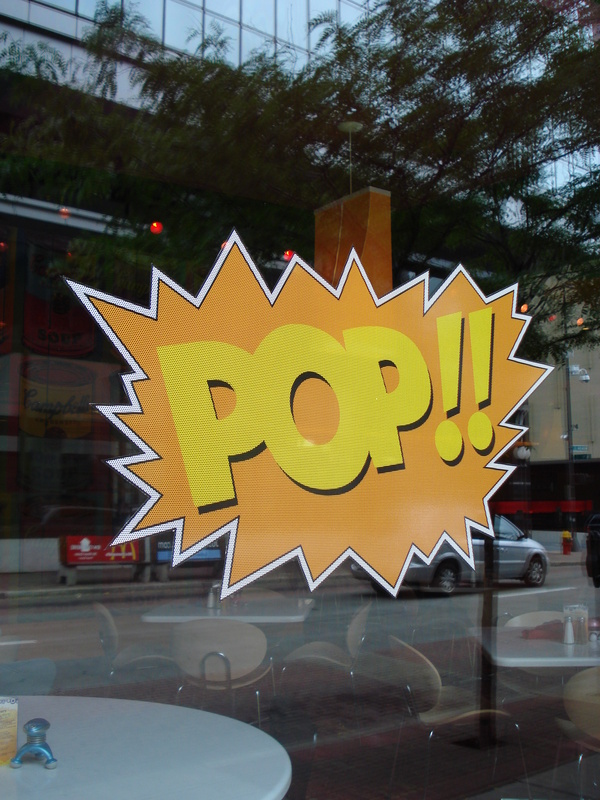 As it is with the fate of Pop! !, though, I guess it’s still a little too early to tell. This entry was posted in St Paul Restaurant Reviews, Tete a tete (That's French for "dating") and tagged Dating on September 12, 2008 by Carrie.